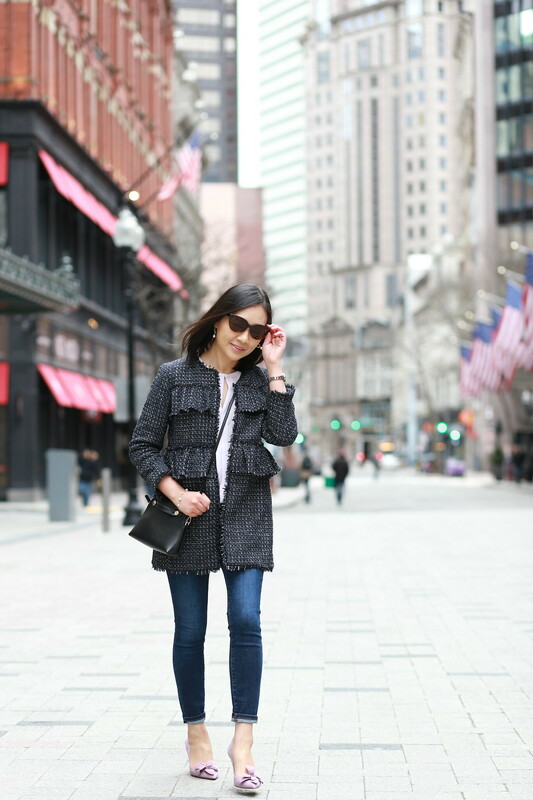 Thank you Ann Taylor for partnering together on this post to share some of my spring favorites for the Friends of Ann Event! Spring is two weeks away and transitional layers like this ruffle tweed long jacket are are perfect for chilly mornings and nights. I love the woven texture and metallic thread which elevates this piece. It can be hard to spot at first but this jacket comes with the pockets sewn shut and you can carefully free them with a seam ripper or sharp scissors. The jacket is fully lined and well made and my usual size XS petite has a slightly boxy but flattering fit. I prefer the jacket worn open but it comes with a clasp at the collar and another one at the chest. My favorite past season blouse (last seen here) is back in four new colors (available here). I chose the lavender icing colorway which is slightly sheer. If I was wearing it alone I might wear a camisole underneath it. It’s available in four colors and I’m also eyeing the olive color. I found that the blouse runs one size bigger and size XXSP fits similar to size XSP from 2016 (reviewed here). The fringe ends of the jacket may have some loose threads so I recommend giving it a good shake in the bathtub before wearing it out. For reference I am 5′ 2.5″ and 107 pounds (you can also refer to my measurements here). My husband loves these Effie suede flower pumps. I was deliberating between the toasted sesame or the smokey grape but I decided to go with the latter for a fun pop of color. The fit and 3.5″ heel height of the Effie pumps are just like past season Charlie patent bow pumps (reviewed here). I took them in my usual size 7. Above photos by my Instagram husband @justintsaiphotography. Get 40% off your purchase at Ann Taylor with code FRIENDS40. Valid in stores and online. Cardholders can use code FRIENDS10 for an extra 10% off (valid 3/7-3/12). Exclusions apply for this extra code (refer to the fine print here). Special thanks to Lilly for sharing this code. You can also earn triple points when you use your Ann Taylor card or LOVELOFT card. Shopping/Shipping Tip: If you sign up for ShopRunner you can get free 2-day shipping on minimum orders of $25+ at Ann Taylor. Being a member of ShopRunner allows me to buy exactly what I want on sale without adding “filler” items to the shopping cart. This is not an ad for ShopRunner and I’m just sharing since I enjoy using their service for lower minimum shipping. I signed up for ShopRunner via PayPal which means I can enjoy a free membership for two years. ShopRunner is also a complimentary service for AmEx and Mastercard holders. Thank you for supporting brands that support whatjesswore.com!